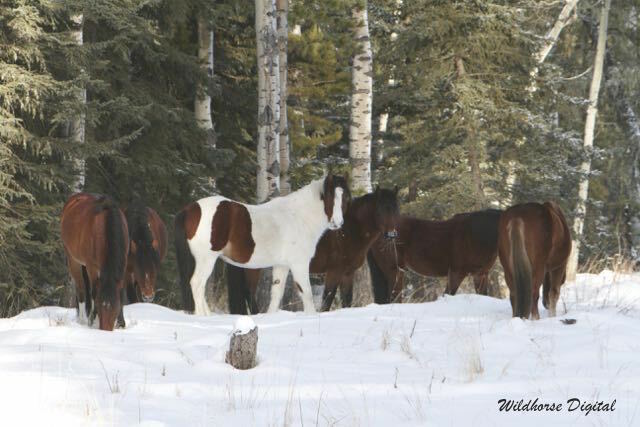 Winter weather has enveloped wild horse country along with the cold tempatures and the snow has really started to accumulate. 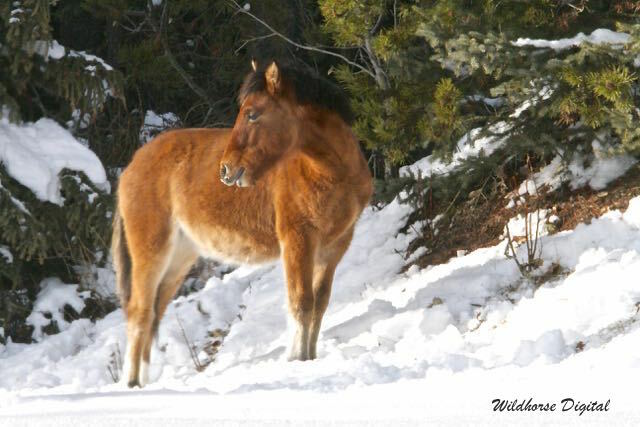 As the snow pack deepens it becomes more challenging for all the wildlife including the wild horses. 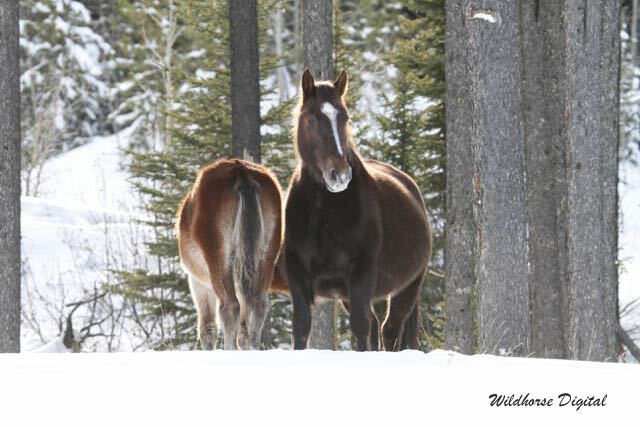 Using their broad hooves, they must dig through the snow to find forage. 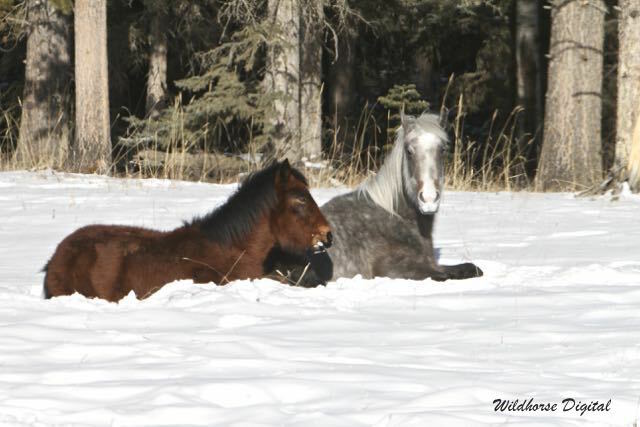 In conditions like this it is more difficult for mares with foals at their side. 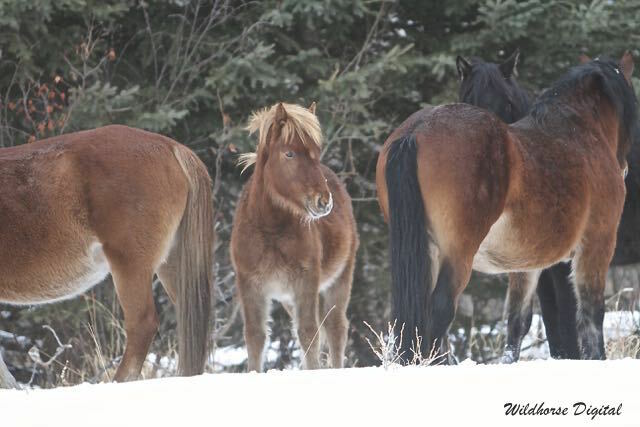 The foals are still nursing and thus these mares have a harder time keeping their body condition in good shape. 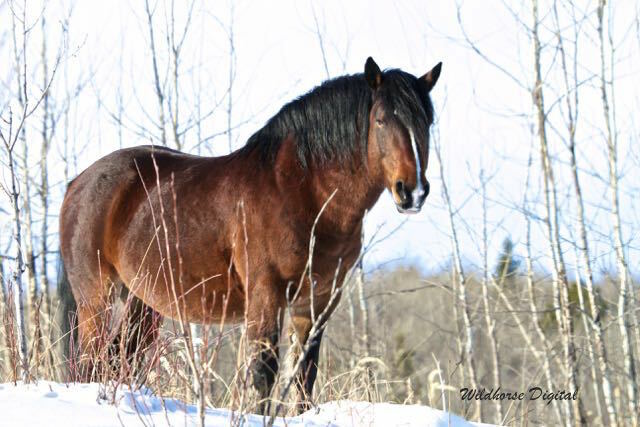 This beautiful stallion has brought his small herd onto this open hillside where the wind blows hardest and therefore helps expose feed. This herd is out in the sunshine which has melted any snow from their backs. Notice the horse second from the back that has such a beautiful silver mane and tail. 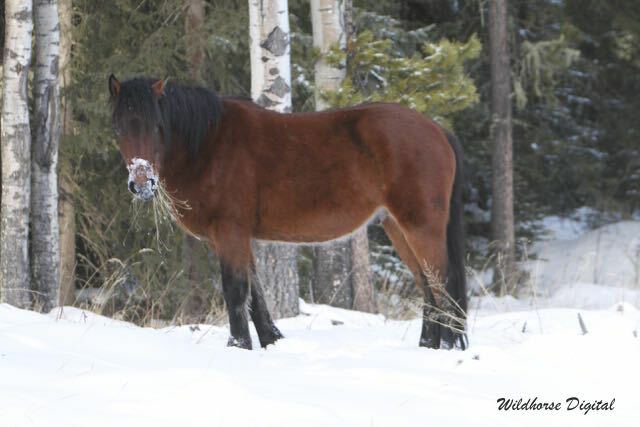 This mare had badly injured her right rear leg in 2017. Showing the resilience of the wild horses, she was able to deliver this thriving foal in the spring and has recovered remarkably. We found her sleeping in the sunshine and she is still in fairly good condition able to move around to find food with the rest of her small herd. 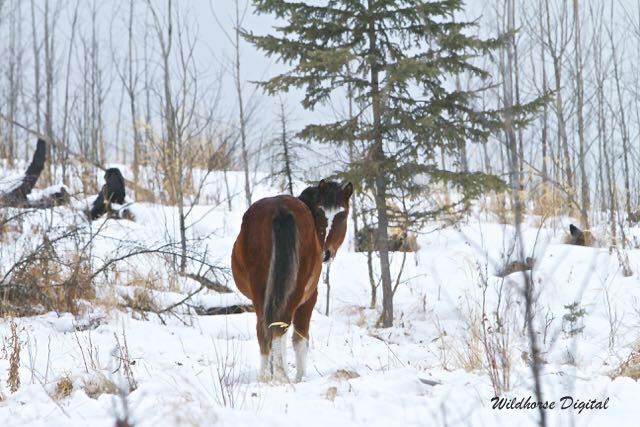 This healthy foal is with his herd in the heavier timber where the trees prevent the snow from building up which exposes some grass. 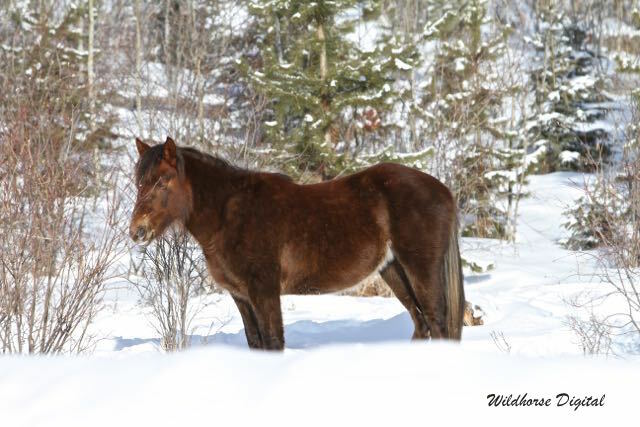 This young mare was definitely enjoying the sunshine on a day where the temperatures were close to 0C. This bright sunshine also helps their overall health and warms them up. Just look at the shiny coats. 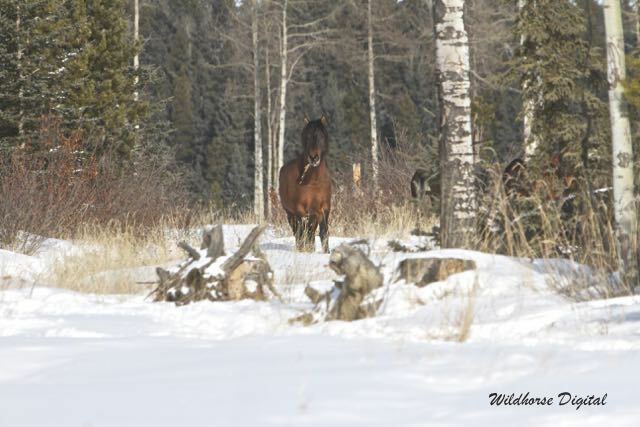 This 2-year old stud is still with his herd who has found feed along the treeline. This spring, however, he will probably be dismissed from his herd and have to find other young boys for company. These two are from Sock’s herd. One of our supporters named him “Flyer” as it looks like a kite on his face. 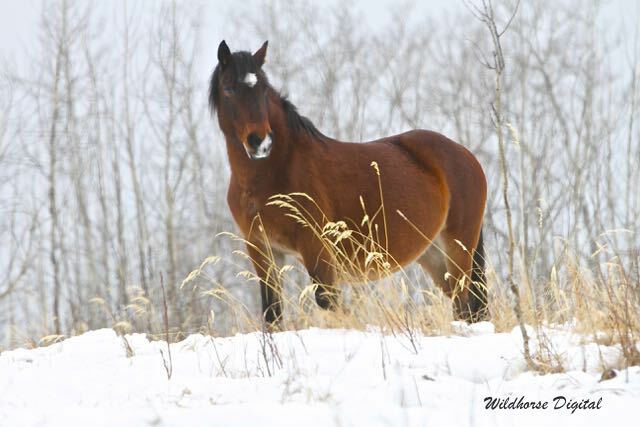 Both mom and babe are doing well this winter under the guidance of such a wise stallion. Pawing through the snow. We often notice deer tracks around these areas where the horses have been digging. 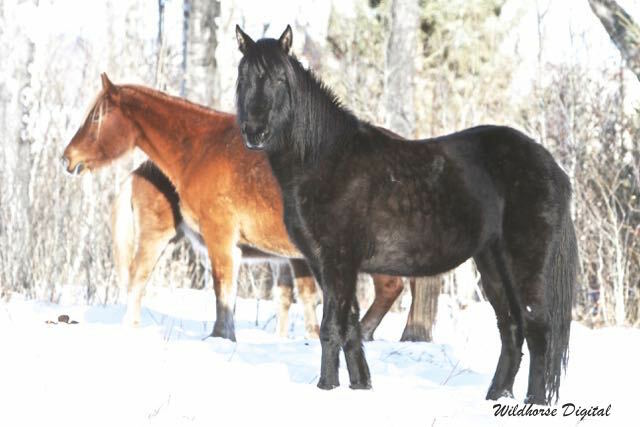 The deer are better able to find their feed once the horses move on. This wonderful stallion gives us “the look”. Who’s this? 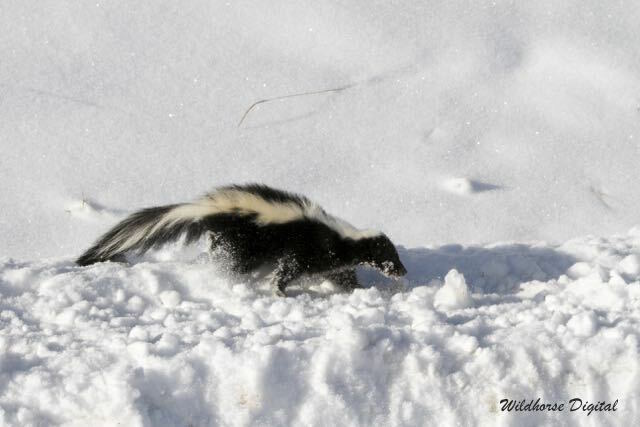 Even the skunk comes out on a sunny day. 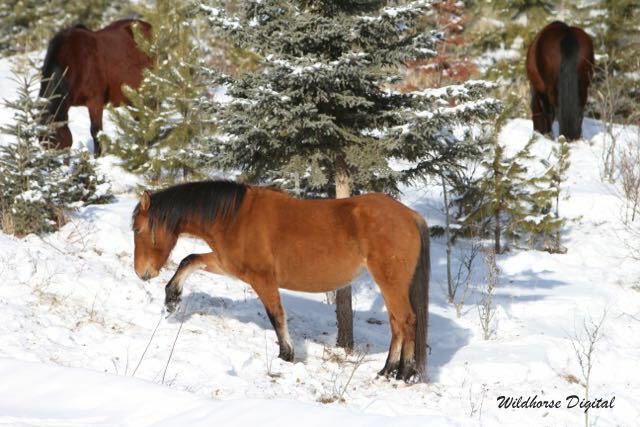 It is amazing the other wildlife that share the country with the wild horses – deer, moose, elk, wolves, fox, cougar and coyotes as well as the birds of prey – we are able to observe as we travel the backcountry. 4 x 4 vehicles are definitely needed in order to navigate the back roads and trails. A lot of the roads are not plowed very often. 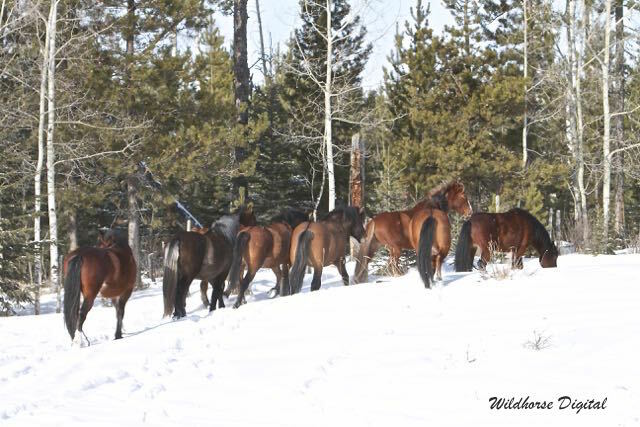 As winter carries on now without much sign of letting up, and the snow deepens, we hope that the horses continue to stay healthy. This young girl is asleep in the sun and we wish her well.